Phone Use in Class: Good or Bad? The Berks History Center and Pretzel City Productions invite you to celebrate local music history at the 6th Annual Magical History Tour concert – the flagship event and official awards ceremony of the Berks County Rock & Roll Hall of Fame. Party like it’s 1969 with performances by Makooch, Steele, the Dave Mell Band and more! 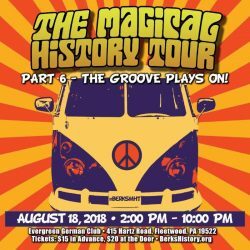 Magical History Tour – Part 6 will be held at Evergreen German Club, 415 Hartz Road, Fleetwood, PA, 19522, on Saturday, August 18th from 2:00pm- 10:00pm. Gates open at 1:30pm. Enjoy a ‘Woodstock-like’ music festival featuring the music and atmosphere of the 60’s, 70’s, and 80’s. Dust off your retro outfits and get ready to dance for history! Magical History Tour is the annual friend-raising event for the Berks History Center. All ticket sales will benefit BHC’s educational programming. The concert features reunion performances by local musicians, both those who played in the 1960’s – 80’s and current acts. In addition to good old rock ‘n roll, party-goers will enjoy an open market of local artists, crafters and vendors while delighting in the delicious fare and beverages offered by the Evergreen German Club. Magical History Tour is rain or shine! Wear comfortable time period clothing and dancing shoes but please leave your refreshments at home. No outside food, drinks, or coolers are permitted. Magical History Tour also serves as the official awards ceremony of the Berks County Rock & Roll Hall of Fame, a permanent exhibit at the Berks History Center that commemorates Berks County’s finest contemporary musicians. The awards ceremony celebrates local musicians that have made a significant contribution to Berks County’s rich musical history.